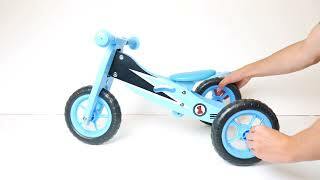 This 2 in 1 first trike and balance bike is the ideal introduction for your little one into the world or riding. No pedals, no gears, no brakes. Simply walk and go. From around 9 months the baby first bike can be used as a trike (3 wheeled). This will allow your toddler to become familiar with riding by letting the trike support them. Once they are confident and can support their own weight competently then the trike can be transformed into a bike (2 wheels). They will then be able to move onto stage 2 and experience the independence of walking the bike along by themselves. This will teach them balance and aid confidence with riding bikes. From here they will be able to progress to riding our junior balance bike (for ages 2 – 5 years) which are taller balance bikes with a larger diameter wheel. The baby first trike bike offers a ‘No Maintenance’ approach and is built with EVA ‘puncture proof’ foam tyres, soft handle grips, a height adjustable padded seat, a lightweight frame with built in carry handle, detachable bell and is made with ECO friendly Birch plywood. Available in 3 exclusive boppi patterned designs. All baby first trike bikes come with a 6 month warranty.